In order to live up to our "Hassle Free" Pool mantra, Monogram includes an automatic ROBOTIC cleaner with every Standard and Ultimate pool we build. The Rapids 4WD is one of the most economical pool cleaners to operate. They don't put any wear and tear on your existing filtration system, require no energy hogging booster pump and cleans and scrubs the entire pool in just a few hours. No more manual vacuuming! Easy to clean top load cartridge filter canister – no messy bags to deal with! Eco-friendly; uses 94% less energy than other pressure cleaners. 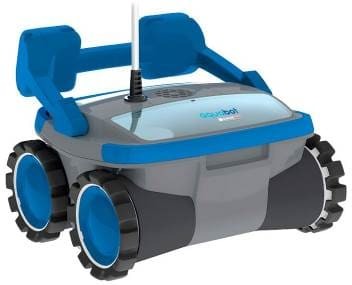 Since this cleaner can be controlled automatically by your automation system, if you have our Ultimate+ pool, you can use our iPhone or iPad to start and stop the pool cleaner as needed!